The Irish fought in the American Civil War, from 1861 to 1865, in large numbers and with great distinction. Over 150,000 Irish immigrants and thousands more Americans of Irish descent fought for the Union; and more than 30,000 (perhaps as many as 40,000) Irish fought for the Confederate States. Their service in the American military -- North and South -- more than anything else, helped to transform the Irish from unwelcomed and often despised immigrants into accepted and respected Americans. The transformation did not occur at once, however. There would be nearly a century before an Irish Catholic would be elected president of the United States, but the Irish soldier in the American army was what started the Irish Catholics on the road to assimilation and acceptance. 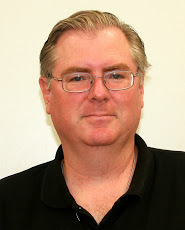 After the Civil War it was a natural progression from being an American soldier or sailor to being a city police officer or firefighter, and then a business entrepreneur, educator, journalist, or politician. Although many Irish came to America just before the war, some had been coming from early colonial days. The first group of Irish who came to America around the time of the American Revolutionary war, 1775 to 1783, were mainly Protestant and Scots Irish Presbyterians. The Scots Irish immigrants were people of Scottish descent, often from the Scottish Lowlands near the border with England, who were “planted” by the English government into lands in Ireland held by Irish Catholics. They were not native Irish originally. The Presbyterian Scots Irish had suffered somewhat under the discriminatory state-sponsored, pro-Church of England (or related Church of Ireland) Penal Laws which were enforced in English controlled Ireland; but they were more “acceptable” to the British than the Catholic Irish. Many Scots Irish (also called Ulster Scots) moved to the Southern colonies (or states) and to the western territories near the Appalachian Mountains. (Andrew Jackson’s family from Carrickfergus, Ireland, for example, went to South Carolina and then Tennessee.) Although there was some discrimination against the Scots Irish, both in lands under British control and in colonial and early America, the strongest prejudice was against the native Irish Catholics. Andrew Jackson could be elected president in the 1800s being Scots Irish Protestant, but it was unthinkable that an Irish Catholic could be elected president then. After the Napoleonic Wars and especially after the Potato Famine in Ireland, 1845 to 1850, huge numbers of Irish Catholics came to America. 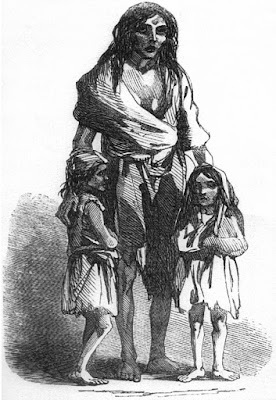 Over one million Irish Catholics came to America because of the Famine. Most of the Catholic Irish went to the major ports and cities in the Northeast, especially New York, Boston, Philadelphia, but also to Chicago and parts of Ohio and Pennsylvania. 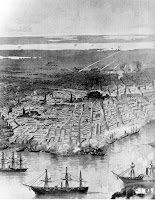 In the South most of the Irish Catholics went to New Orleans, a major port city and the most populous city in the South just before the Civil War. 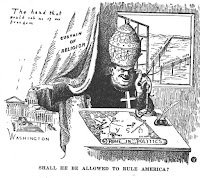 the Pope plotting to rule America, 1943. Prejudice existed well after the Civil War. New Orleans, unlike most other major cities in the United States then, had a strong Catholic heritage having been governed for many years by Catholic France and later by Spain. Other places in the South with some Irish Catholic immigrants were Savannah, Georgia; Mobile, Alabama; and Charleston, South Carolina. But with the sole exception of New Orleans, most of the South paled to the North in Irish Catholic immigration. Interestingly, New Orleans was the sixth most populous city in the United States just before the Civil War, and it was larger than many Southern cities combined. It was the exception to the rule, however, as the North, in total, had over 20 million in population while the South had just five million whites in population with four million enslaved African Americans in 1860. See US Census 1860 at Wikipedia. By the 1850s in America, the Irish Catholic immigrants and their descendents were suffering from widespread anti-Irish and anti-Catholic sentiment. 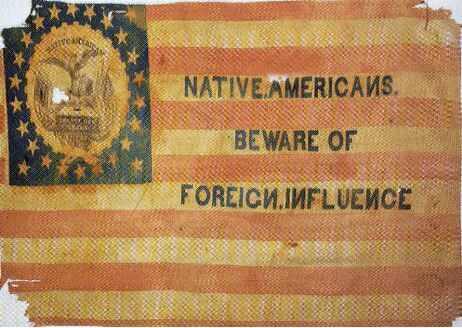 The situation was made worse by a political group, which grew out of the old Whig Party, called the Native American Party (not to be confused with American Indians) which was hostile to immigrants and especially people of non-Anglo-Protestant backgrounds like the Celtic Irish Catholics. The party changed its name to the American Party later on, but it is better known to history as the Know Nothing movement. It acquired this odd name because when asked about this movement, a Know Nothing, who liked his secrecy, would say he “know[s] nothing” about the movement. So, it functioned more like a secret society than an open political party. 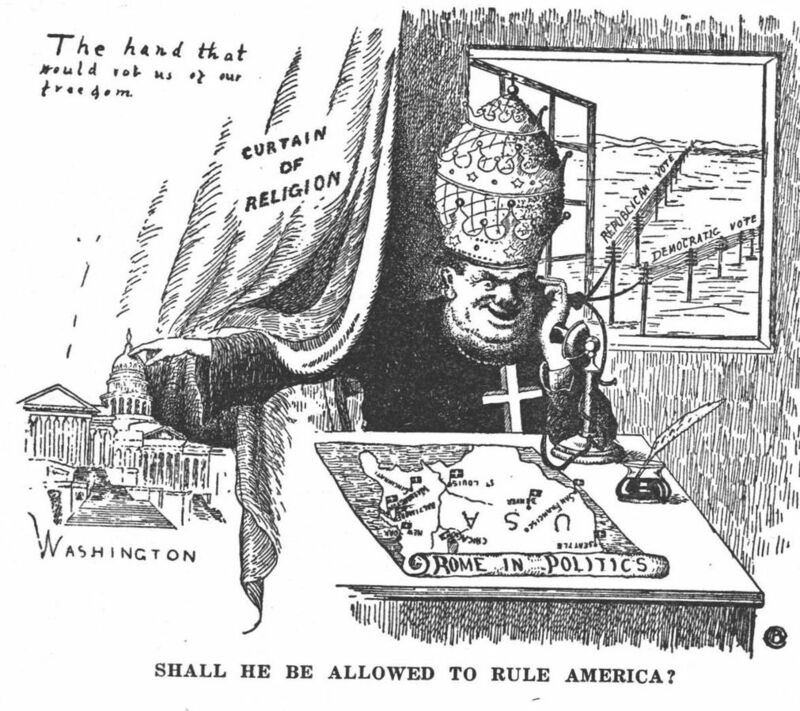 It feared and hated all things Irish and Catholic -- often claiming that the Roman Catholic Church would try to dictate political and religious policy in America. The Know Nothings believed that the immigration of Irish, and also German Catholics at that time, would fundamentally transform and ruin American culture. Facing discrimination and prejudice, the Irish Catholics in America were often denied access to employment opportunities and social advancement. Ugly signs and ugly attitudes like “No Irish Need Apply” were prevalent when the immigrants sought work. 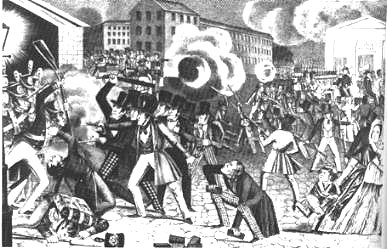 There were several cases where anti-Irish Catholic riots occurred in major cities such as in Philadelphia, New York, and even New Orleans. 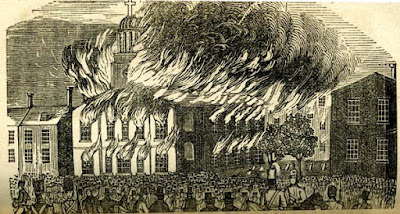 In some cases the Irish Catholics, often through a fraternal organization called the Hibernians, had to physically stop angry and violent anti-Catholic mobs from attacking or even burning down Catholic churches in major American cities. The St. Augustine Catholic Church was burned in the Philadelphia Nativist Riots in 1844. Bigoted people often called the Catholics insulting names like "Papist" and "Romanist." As a result the Irish immigrants, who were usually unskilled and uneducated, except in their Faith, found employment doing the dangerous and difficult work no one else wanted such as digging canals with picks and shovels, mining coal, or working as stevedores and “screwmen” who loaded bales of cotton and other cargo into the holds of ships on the waterfront. But there was another thing the Irish had proven they could do and do very well -- fight. So, when the American Civil War started, it was no surprise that the ranks of the American armies, both North and South, were filled by the Irish and Irish Americans. The list of Irish in the war would be very long. They were sometimes undisciplined, rowdy, and reluctant to respect authority. But when the battle started, they were among the very best soldiers and always ready for a fight. Wise army officers understood this and after a while just let them be. This was certainly the case with the Irish in the Louisiana Tigers from New Orleans who served with Stonewall Jackson and Robert E. Lee, and the Fighting 69th from New York City who famously saw action at Fredericksburg and Gettysburg, among other places. These were among the most famous, fiercest, and most daring soldiers during the Civil War. They were, in short, the shock troops of the army. Whether in the North or the South, the reputation of the Irish was that of a fighter. There is a story, perhaps apocryphal, which takes place as General Robert E. Lee surrendered to General Ulysses S. Grant at Appomattox. In it, supposedly, one of Lee’s officers told one of Grant’s officers that the reason the Union Army won was because it had more Irish troops than the South did. The story is probably made-up, but it nevertheless reveals a truth -- the Irish soldiers, much like the presence of African American soldiers and German immigrant soldiers, played a vital role in the Union’s victory. This victory for the United States over the Confederate States preserved the Union and ended slavery, but it also was a major victory for social and political progress for the Irish in America. Prejudice still existed; but after their distinguished service in the military, the patriotism of the Irish to America could not be reasonably questioned. Following are some of the units the Irish served in during the American Civil War. The largest and most famous units came from New York state. 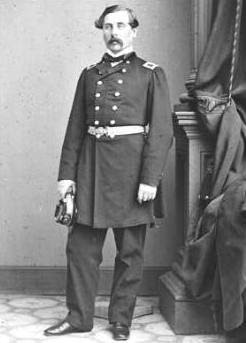 The “Fighting 69th” of New York was led by Irish born General Thomas Meagher (pronounced as MAHR). It had its origins way before the war in 1851 with Irish volunteers. This was probably the most famous of all the Irish units during the war. It was part of the Army of the Potomac’s Irish Brigade and saw combat throughout the war but notably at Fredericksburg, Antietam, and Gettysburg. Pennsylvania had units with names like Hibernia Greens, Irish Volunteers, Montgomery Guards (named after an Irishman who fought in the American Revolutionary War), and the Emmet Guards (named after the Irish political leader Robert Emmet.) Philadelphia had the 69th Pennsylvania Volunteer Infantry (Irish Regiment). It was deliberately named after the famous New York 69th to honor them. One Irish officer, Michael Corcoran of New York’s Irish Legion, encouraged the Irish in Philadelphia to join the Union Army by telling them their training would help in one day forming a unit of veterans to fight the British. Other Northern states with significant Irish units were Illinois with the “Irish Brigade of the West” or 1st Illinois, Indiana, Maine with the 15th Maine under Col. John McClusky, Missouri, New Hampshire, and Vermont with the Emerald Guards led by Irish born Captain John Lonergan who received the Congressional Medal of Honor for his actions at Gettysburg. Louisiana had many Irish in the war. New Orleans was the South’s largest city by population and had the largest number of Irish Catholics in the entire South. Between 30 and 40 thousand Irish served in the armies of the Confederacy. The South was overwhelmingly Protestant, but New Orleans was a Catholic city historically. Many of the Irish in the South blended into Southern culture and saw the act of secession by the Rebels as similar to the Irish attempt to gain independence from Britain. 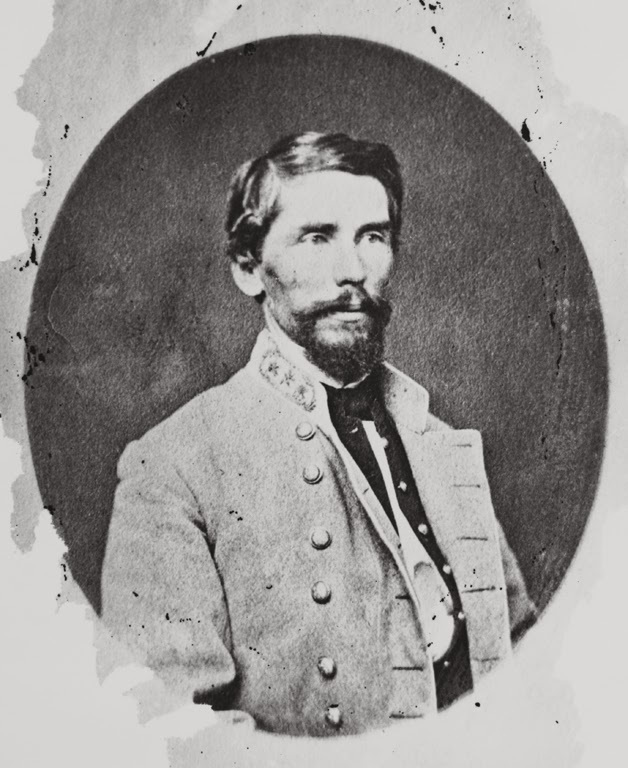 Some Irish were against slavery like the General Patrick Cleburne who became known as the “Stonewall of the West.” He even advocated freeing the slaves and allowing them to join the Confederate Army. But other Irish feared that if the slaves were freed they would compete for working class jobs, while other Irish felt the Abolitionists ignored the harsh conditions under which the Irish immigrants suffered in factories up North or in the dangerous work they had to do as a result of discrimination. Whatever the case, although the Irish did join the various armies in the Confederacy, with the exception of two regiments in the Louisiana Tigers which were mainly Irish and mainly from New Orleans, there were no large Irish units or “Irish Brigades” as in the North. New Orleans had a population that was about one quarter Irish, at least 24,000 strong. It supplied the largest single number of Irish (and predominantly Irish Catholic) soldiers from the South. Like some other places, New Orleans had units with names like the Montgomery Guards, Emmet Guards. 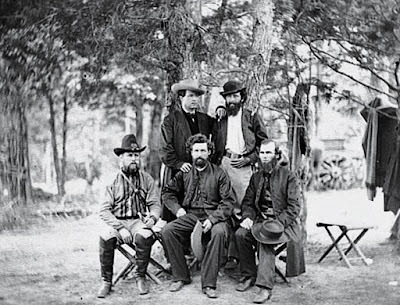 But the most famous bunch by far was a very rough crew who worked on the waterfront called the “Wharf Rats.” They became of part of Roberdeau Wheat’s 1st Louisiana Special Infantry Battalion called the “Louisiana Tigers.” They fought against the famous New York 69th at First Bull Run (or First Manassas) and then in the Shenandoah Valley under Stonewall Jackson. Other Irish were in the 6th Louisiana Infantry Regiment and the 7th Louisiana Infantry or Pelican Regiment. There were Irish from Louisiana serving in Virginia, in Tennessee, and in the Western Theater, west of the Mississippi. 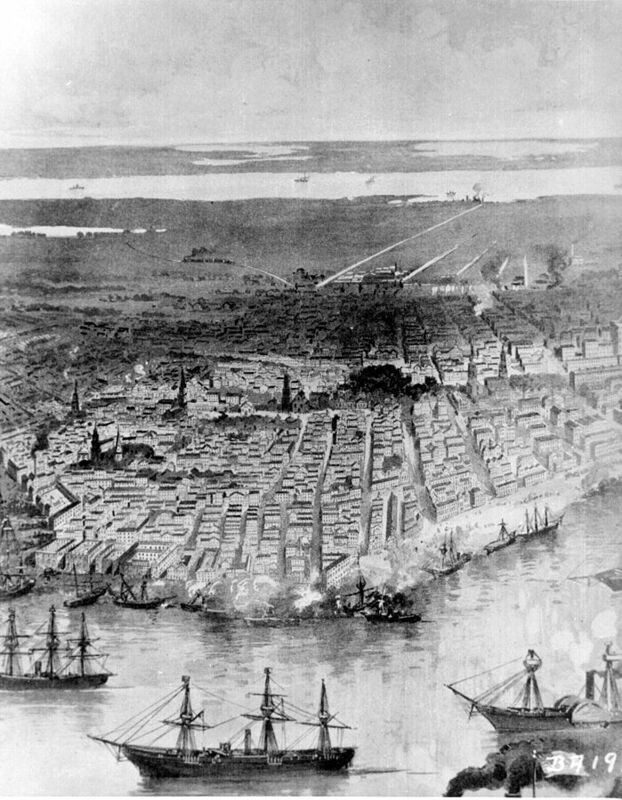 New Orleans fell to Union forces in April of 1862. It supplied the Rebels with soldiers early in the war for about one year, although much of the rest of Louisiana remained in Rebel hands until 1865. Mobile, Alabama had an Irish unit called the Emerald Guards which formed from a group of firefighters, the Mechanics Fire Company. They carried a green flag with a shamrock and a harp on it and the warcry “Faugh A Ballagh” (pronounced FAWK a BAL ak) which meant “Clear the Way.” This type of flag and warcry was seen in many Irish units up North as well. Arkansas had the 15th Arkansas Regiment which was led at one point by Patrick Cleburne. It had many Irish soldiers including a unit of Irish riverboat workers called the Napoleon Grays. 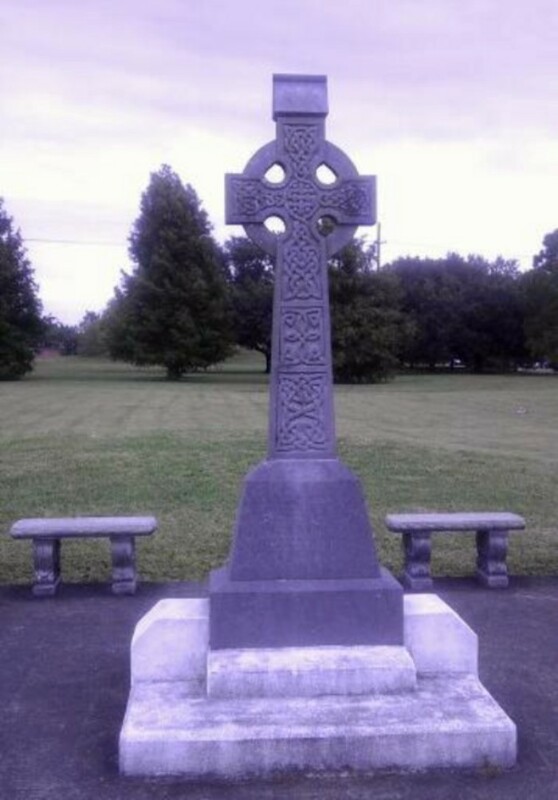 Savannah, Georgia had a number of Irish Catholic soldiers in the Irish Jasper Greens. (William Jasper was a Revolutionary War hero.) The Lochrane Guards from Georgia, which had many Irish, fought at Marye’s Heights at Fredericksburg in 1862 and tragically fired upon their fellow Irishmen in the Irish Brigade in the Union Army attacking the Heights. Texas had many Irish from Galveston and also in a unit called the Jefferson Davis Guards. Virginia had Irish in the Montgomery Guards and the Emerald Guard; and the 1st Virginia Infantry Battalion had many Irish. Because of their dedicated service in the American Armies during the Civil War, the Irish proved they were patriotic, trustworthy, and very brave. They were willing to fight, die, and kill for their new country. And the did it all very, very well. One of the typical mottos on an Irish battle flag had the words, “Go where glory waits you.” That is where the Irish soldier went during the Civil War. And by seeking glory, he eventually found justice for his people and for America. Anti-Irish and anti-Catholic bigotry still lingered on in America, but it became less and less acceptable. The heroic service of the Irish soldiers in the American Civil War, however, guaranteed that the Irish would eventually become Americans in full.